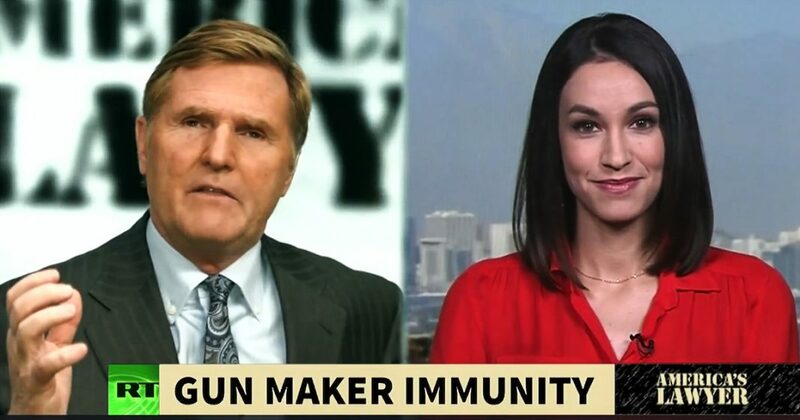 Via America’s Lawyer: Mike Papantonio talks with Brigida Santos about the immunity gun manufacturers enjoy from facing any lawsuits for selling weapons of war to civilians. Mike Papantonio:	Gun manufacturers are one of the only industries in America that have immunity from facing lawsuits. Congress granted gun makers this power in 2005, which consequently let families who lost children in mass shootings, like Sandy Hook and the recent event in Florida, without any way of holding these corporations accountable. Some of their firearms are designed specifically with the power to inflict mass damage, and yet the law says you can’t hold them responsible. Joining me now to talk about this is RT America correspondent Brigida Santos. Brigida, can you explain for people watching who aren’t familiar with this law, what is it? How did it come about? Most people have no idea that these gun manufacturers, for the most part, are immune from any kind of meaningful lawsuit. Brigida Santos:	Yes. So this law is the Protection of Lawful Commerce in Arms Act, and it was enacted in 2005. What it does is it provides immunity to gun manufacturers and dealers. It basically shields them from any civil liability lawsuits in state and federal courts. Now, this was signed by President George W. Bush in 2005 after a series of lawsuits in the 1990s ended unfavorably for the gun industry. It was around that time that the gun industry began lobbying heavily to Congress, and, of course, all of that money did get the influence that the industry needed here. Ever since 2005, people allege that the gun industry has acted negligently and carelessly and recklessly in its marketing and distribution of firearms allowing unauthorized users and criminals to get their hands on these weapons, all while knowing that they will be used to carry out crimes, Mike. Mike Papantonio:	Well, Brigida, it’s even more involved than that. We know that if you look at the design aspect of this, let’s just talk about design defect, there are all kinds of ways to make guns safer. There are ways to where you can even prevent a child from ever shooting the gun without some type of combination. There are types of signaling devices that can be put in them that prevent the unlawful use of the weapon. There are half a dozen ways that are right out there in the market right now that could be put into this users technology. Do we know of any technology that exists that have been built into these weapons, which are used in any of the recent shootings? Brigida Santos:	Of course, there is safe gun technology, things like wrist bands with RF ID chips in them that would only allow the person wearing the wrist band to unlock and deploy the weapon. There are also fingerprint technologies that can be implemented into weapons to make them safe from accidents or preventing unauthorized users from shooting them if they are stolen. But it does not prevent somebody like Nikolas Cruz, who purchased this gun legally in Florida following all of the laws and rules and regulations. So yes, there are safe technologies, but it doesn’t necessarily mean that it’s going to stop these mass shootings, especially if that user gets this gun legally, Mike. Mike Papantonio:	Well, I can tell you this, a friend of mine had brought a case in New York. It was a well plead case. It was well researched. It was on its way to a jury, and when Congress passed this law to prevent these types of lawsuits, but what he found was that some guns are designed, Saturday night specials, they’re sometimes referred to, and the documents that he found behind the Saturday special, I guess is the best way to put it, is that they had in mind using the gun. They knew exactly how it was going to be used. They knew exactly their market. It was basically a bottom feeder market. We’re going to sell it cheap. It’s going to be used for exactly what we know. It’s not even used for self defense. It’s used for offense. So he had all of the information on that gun, had plenty to go to a jury, and was prevented from doing that because of this immunity law. I think we’re going to see more and more of that unless we get Congress to step back and change that. The only way you can shut these people down sometimes is take their money. Some of the Sandy Hooks families, for example, who lost their six year old to that awful shooting tried to sue the manufacturers of the AR-15 that gunned down their child. How did that case turn out? Was it actually affected by this immunity law? Brigida Santos:	So these families sued Remington Arms Company, which is the manufacturer of that AR-15 used by Adam Lanza to murder all of those children. Now, they sued saying that the AR-15s were created by the US military to inflict mass casualties on the battlefield, and therefore, they should not be sold to civilians like Adam Lanza who can misuse them. Now, unfortunately, a judge initially ruled against these families citing the Protection of Lawful Commerce in Arms Act. Those families have appealed to the US Supreme Court. That case is currently pending, Mike. So everything is lying on this case to see whether anything is going to change with this law, Mike. Mike Papantonio:	What are your call on the chances right now, for example, with all the interest in this, for challenging this immunity through Congress? What’s your take on that? Brigida Santos:	There have been many constitutional challenges to this law. All have so far failed. Now, this lawsuit with the families from Sandy Hook, if the Supreme Court rules in their favor, as I said, it will change everything, but the likelihood that that is going to happen is pretty slim, because it’s really relying on a previous Supreme Court ruling from the 1970s in which a family won against a manufacturer of a slingshot. So they’re trying to base this case on the ruling there. I don’t know that they’re going to be successful here. States can do things like California did when they repealed this law, but still 34 other states have immunity laws protecting gun manufacturers and dealers. So it’s going to be a really tough fight here, Mike. Well, the truth is very good lawyers all over the country have tried. This immunity bill has got to go away before you’re ever going to stop this. If you sue a manufacturer that makes one of these guns that they know its a design defect, they know it’s not going to be used like we would expect it to be used, if you’d just be able to take them to court and take their money away, put them out of business, then the next manufacturer would change the way they do business. This is an easy solution. Unfortunately, you have Congress, again, getting in the way of any chance of changing all this. Brigida, thank you for joining me.